I recently spent some time with my nephew who is a student in a public school in New Jersey. He was sharing his excitement about singing in his school's holiday concert. "What are you singing?" "We are singing: The Marvelous Toy, Over the River and Through the Woods, and Silver and Gold." Although this last song has a reference to Christmas trees, the songs are all safely secular. In my travels into lots of different schools, I have seen at least three different strategies for dealing with our society's current we-can't-call-it-Christmas-or-anything-else-religious paranoia. Some schools celebrate everything--Christmas, Hanukkah, Kwanzaa, Festivus--you name it, they celebrate it. They mark the day, learn about that religion in social studies classes, sing songs from each tradition, create art projects, and generally celebrate the rich cultural heritage of all their students. E pluribus unum. Out of many, one all inclusive celebration. Some schools celebrate nothing. There are no decorations of any kind. No Christmas trees, no Menorahs, no wishing a merry this or a happy that. When a student or anyone else asks about this practice, they say they don't want to offend anyone. A strict separation of church and state (not that this is what the first amendment actually calls for). Some schools celebrate the generic, secular "holidays." Not withstanding that the root of the word holiday is "holy day," in these schools people greet each other with "Happy Holiday," have Snowflake parties, and decorate the hallways with snow people ("snowmen" would be sexist) and ginger bread houses. Each school must accommodate this tricky time of year in a way suited to its community. I have been in public schools in very conservative areas that unabashedly hang posters that say "Jesus is the reason for the season" and others in which there isn't even a symmetrical construction paper snowflake in sight. At The First Amendment Center, Dr. Charles Haynes advocates an educational, non-devotional approach to the holidays for schools. A school's role is to teach and, in that respect, as long as religious holidays are treated as teachable moments, they can form part of a school's December. Teachers, administrators, chorale directors and the like who choose to mark the holidays must have a clear educational purpose, a sensitivity to those who may be made to feel like outsiders, and a concern for balance and fairness in whatever they are doing. This approach fits best with QISA's definition of Belonging, the first and most foundational of the Conditions: Being a valued member of a community, while still maintaining one's uniqueness. During December, a school can celebrate the unique and special holiday tradition of each and every member of its learning community. P.S. 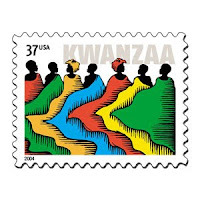 The Kwanzaa stamp was designed by artist, Daniel Minter, illustrator of QISA's children's book Sam's Adventures in School and the designer of all of QISA's graphics and logos.